Topic: H8PVMNT's Breakfast Tech Thread! This morning I had some French toast made with our own eggs with a trout my kid caught me from our own creek, washed down with black coffee and a tall glass of milk from our own cow. So this was a real DIY in house breakfast made from our local stuff. I love trout for breakfast! Re: H8PVMNT's Breakfast Tech Thread! You win! That sounds like breakfast at its finest. Im more of a brunch person, just not really hungry till 10 or so. Im probably just going to try the jerky i smoked last night and drink some coffee. Our ladys are really starting to lay eggs again so egg dishes are always on the menu. My wife bought one of those egg poacher trays for eggs Benedict and man its so much easier than just a pan of water, dont use it much but if we are doing a brunch with friends or family it really comes in handy. Now smoked salmon on a tosted everything bagle with cream cheese.. i could eat that every day. Damn, I succeeded in making myself hungry! Pics of the salmon bagel or it didn't happen! Replace trout w/home raised bacon or ham, and that was my school day breakfast as a kid, on the weekend it was a bowl of cereal w/cream or heavy cream/milk combo. We made some ham and bacon a few years back from a pig we raised. It was so much better than what you buy at the store! The pig acted really offended when I shot him . They really are pretty smart animals. This morning my wife brought me breakfast in bed. I woke up to the smell of hot coffee and sausage links. Breakfast was sausage, over easy eggs, toast from a pan, blackberry jam, milk, coffee and an orange garnish served on fine china. No picture because she kind of blindsided me. that that's heart braking you don't eat sausage ! I'd save it for making a turducken! .... The pig acted really offended when I shot him . They really are pretty smart animals. THAT comment just made me throw up my breakfast! Funny when I buy meat from the store and think of how it was handled and how the critter was living I get a little ill. If you want a good meal, something has to die. Might as well do your own killing. Then at least you know where it's been. That pig was kind of a jerk anyway. Two farmers, John and Henry, were sitting around talking about their day when John notices a pig with a wooden leg hobbling across the front yard. He turned to his friend and asks, "Henry, why does that pig have a wooden leg?" "Well, John, that pig...," his eyes mist up, "That pig's mighty special! A few weeks back a wild boar attacked me while I was in the woods. That pig there came a runnin', went after that boar and fought him off. Saved my life!" "And the boar tore up his leg?" "No, just got a few scratches, nothing too serious. But that night the barn caught fire. That ol' pig started squealin' like he was stuck, woke us up, and before we got out here, the darn thing had herded the other animals out of the barn and saved them all!" "Ahh so that's when he hurt his leg?" "No, John, the next day my tractor hit a rock and rolled down the hill into the pond. I got knocked clean out. When I came to, that pig had dove into the pond and dragged me out...but that's not how he hurt his leg." "Oh no, no, he was fine. Cleaned him up real nice, too." "Well", Henry begins to explain, "A pig that amazing...you don't want to eat all at once." We made some ham and bacon a few years back from a pig we raised. It was so much better than what you buy at the store! Yes, like eggs and tomatoes, traditional farm raised meat and vegetables always taste better. Not sure when everything lost its taste, didn't notice that much difference when I went to college and had to buy groceries from the store, then again that was before factory farming became the norm. The pig acted really offended when I shot him . They really are pretty smart animals. That they are, just not smart enough to escape being domesticated, but then again neither are men. I feel the same way, the first animal i saw slaughtered was a cow when i was 5. Sounds like its something in the processing or the cure. And to stay on topic, i had cold papa murphys stuffed pizza for breakfast! I am HORRIBLE at cooking fish, i can cook and/or bake most things, but fish is not my strong subject! Smoked some Brisket yesterday and threw a fatty on with it (log of tennessee pride hot sausage) for a couple of hours. Soaks up a bunch of the hickory smoke and tastes delicious. 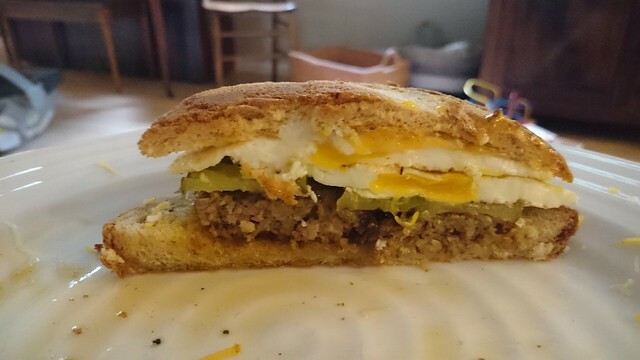 Sliced some and made this breakfast sandwich with it. Chorizo omelet with fried potatoes! 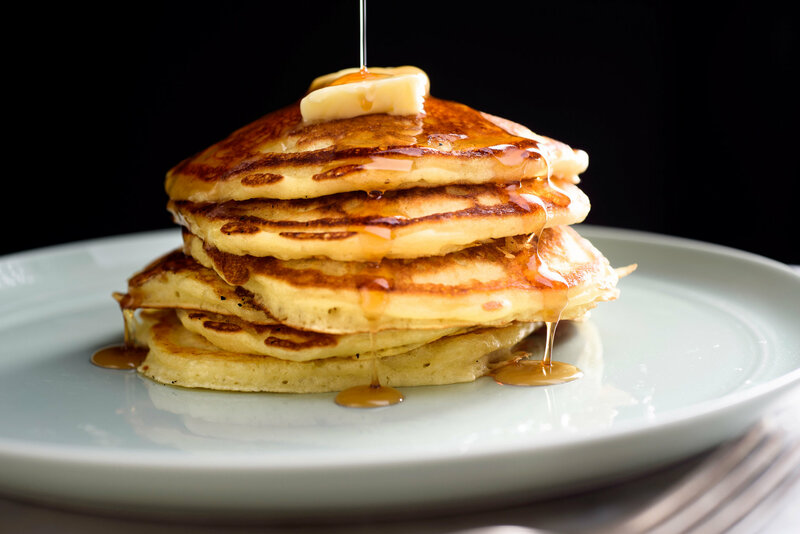 No picture because I am a lamo, but this morning I made apple cheddar pancakes with bacon on the side and they were awesome. Page created in 14.854 seconds with 43 queries.